North Carolina ( March 7, 2012)- On March 16, thirty years will have passed since Alexander Edwin Shaw IV’s wrecked car was found slammed into a pine tree near his home in Wagram , NC. His disappearance generated an extensive land and Lumber River search by sixteen rescue units, and a National Guard and Ft. Brag army helicopter. Search efforts continued for several days but no trace was found that week and none has been found in the thirty years that have passed. His sister, Grace Shaw Abrams of Greenville, SC and mother Jane Blake Shaw of Chadbourn, NC are giving notice of unclaimed 1983 reward money. The state of North Carolina still has $5000.00 for information leading to the arrest and conviction of those responsible for the disappearance of Alexander Edwin Shaw IV, of Wagram, NC formerly of Chadbourn, NC. According to Janie Pinkston Sutton, Special Agent in Charge, N.C. State Bureau of Investigation, Southeastern District, this reward will remain in effect until such time as information is received that leads to an arrest and conviction. Mrs. Abrams said, “Our family is offering an additional $5000.00 making a total of $10,000.00 in reward money.” Anyone having information concerning the case should contact Investigator Jonathan Edwards of Scotland County Sheriff’s Department or the N.C. State Bureau of Investigation, Southeastern District. Edwin Shaw’s missing person profile is located at www.namus.gov or https://www.findthemissing.org/en/cases/2420/1/­­­­­­­­­. NamUs provides a national centralized publicly accessible database for missing persons and the unidentified. The database is available to law enforcement, medical examiners, coroners and the public. Namus staff and advocates were recently in Elizabethtown, North Carolina conducting NamUs training for sixty law enforcement agencies from several North Carolina counties : Robeson, Cumberland, Moore , and Bladen to name a few on how to utilize the database to assist with missing persons cases. In addition they gave missing person’s families an opportunity to establish a profile and provide family DNA samples to be compared against the unidentified bodies’ database. “We hope the reminder of the unclaimed reward money on this anniversary will lead someone to contact the authorities. Thanks to NamUs forgotten missing persons cases can be remembered. Cold missing persons cases like my brother’s do matter to families- after all we are the ones left behind without resolution and every missing person has family somewhere.” says Mrs. Abrams. As parents & families of children who were abducted, sexually assaulted, murdered, recovered or are still missing, the Surviving Parent Coalition is calling upon the United States Congress to pass H.R. 1300 S. 702 The Help Find The Missing Act (Billy’s Law). 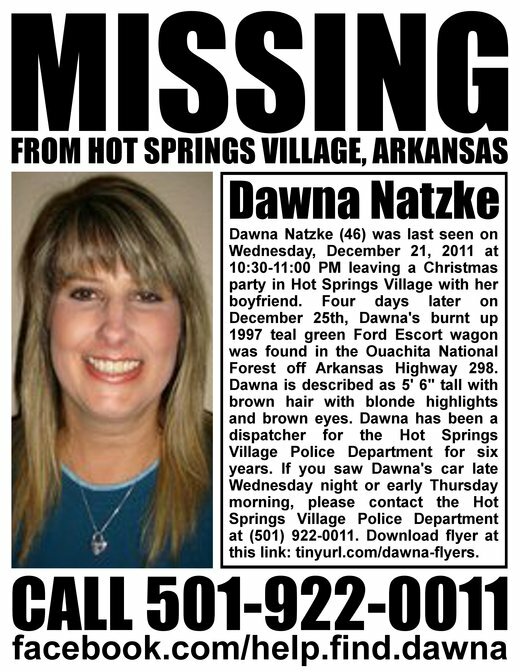 ‎12/31/2011: A body has been found by volunteer searchers in the Ouachita National Forest. The Hot Springs Village Police have confirmed that a body has been found during a search involving over three hundred volunteers this morning. Investigators say it is too early in the investigation to confirm the identity. 350 volunteers and the Red Cross met at Jessieville High School at 8 am to search for clues in the disappearance of Dawna Natzke. Around 9 am, a body was found south of Highway 298. It seems not a day goes by when someone doesn’t go missing in this country. Makes you wonder. Dawna Natzke was watching TV the night of December 21 according to her boyfriend. He went to bed at 11 p.m. and when he woke up, she was gone. Because she works as a police dispatcher in Hot Springs Village, Arkansas, he thought she had gone to work. No one knew she was missing for 2 days. Her son reported her missing December 23 and the next day, her car was found completely burned out in a remote section of a forest. So far, no sightings and no reported suspects. 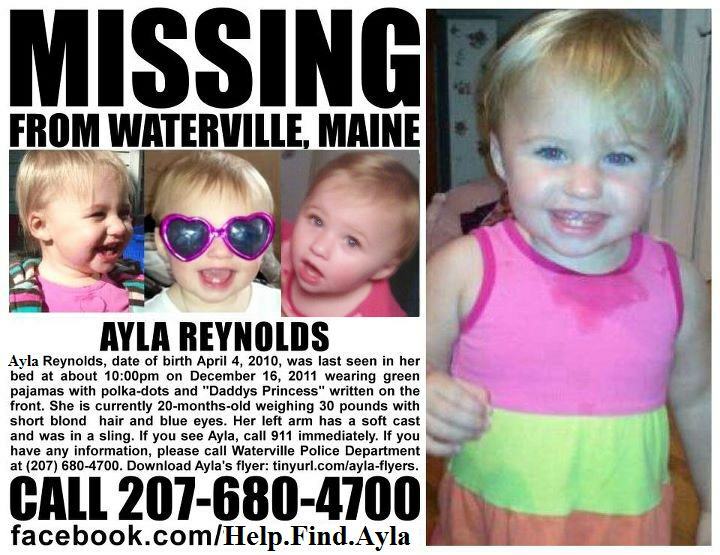 Ayla Reynolds, the 20-month old girl who has been missing since December 16 has not been found according to a post on the Waterville, Maine Facebook page. Earlier in the day rumors that she had been found dead and rumors that she had been found alive circulated around the internet. Not true and the search continues. This afternoon, rumors have run rampant regarding the status of this case. Please understand that at this hour, Ayla has not been located. Investigators are working harder than ever on this case, and we will release information as it becomes available and appropriate. 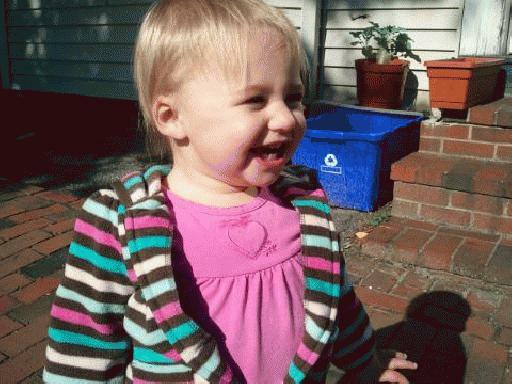 We fully understand the emotion and attention that Ayla’s disappearance has caused. Please stay with us as we move forward, and please share this with your friends to help get the word out. 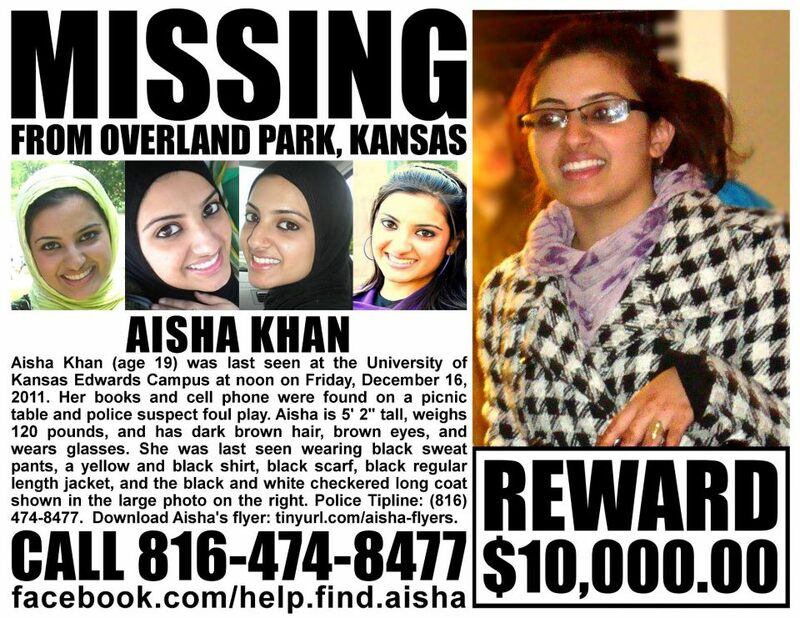 Overland Park police said 19-year-old Aisha Khan was last seen at the University of Kansas Edwards Campus in Overland Park at about Noon on Friday, December 16,2011. 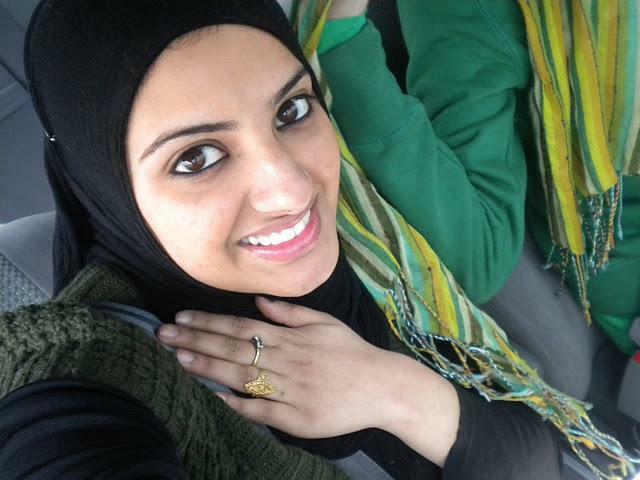 Police said Khan is 5’2″, weighs 120 pounds and has dark brown hair, brown eyes and wears glasses.She was last seen wearing black sweat pants, a yellow and black shirt, black scarf, black regular length jacket and a black and white long outer coat.If you have any information about her location you’re asked to call Overland Park police at 816-474-TIPS.